Now this is something to excite the JPDM. A new Toyota (that is enough excitement in itself). Also a new Toyota that pushes the “E” or “ecologically friendly” extremes by making new in-roads into fuel efficiency. 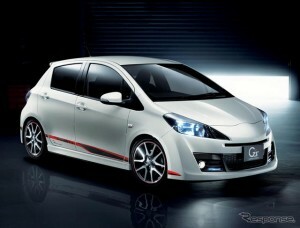 Toyota’s sports conversion series has a new addition, the Vitz G Sports. Renamed from the RS. Evolution has brought out perhaps the best Vitz so far. Looking at the picture Toyota has given it a jazzy aero kit. Red stitching on the steering wheel , shift knob, and leather seats and carbon fiber interior paneling. Toyota has used the Vitz RS base chasis chassis NCP131 and built onto it. The engine is the 1.5L DOHC 1NZ-FE producing 80kw (109PS) at 6000rpm. Available in 5 speed manual as well as the CVT-i manual mode. It will be available in 7 colours. It will be released in October, but it may take a few weeks after that to see near new ones appear in the used car auctions. Something to look forward to! Previous PostHow much is the value of a name? More than you think!